On the surface Charlotte’s is an innocent and charming old-fashioned-new-fashioned neighborhood ice cream parlor with a tin ceiling and a toy train delivering shakes to eager children sitting along the counter. You would never know the 98-year-old secret that lies beneath. You couldn’t tell from the soft-serve taps where customers select from 18 gelato, yogurt, ice cream and sorbet flavors – including allergen-free options. You wouldn’t know from the specialty coffee machines churning out caffeine boosts for parents whose kids are sugaring up. You’d have no idea from the genteel rocking chairs, the table seating, or the old-school candies on sale at the counter that there was anything but family fun here. Not even new owners Nick and John DeVito knew about the racier history of the building at 294 Main Street in Farmingdale when they bought the mixed-use building almost five years ago with plans to rent the apartments, house their existing business, and open a retail shop on the ground floor. They opened Charlotte’s Yogurt (named for their mother and grandmother) soon after. But when they poked around in the basement and found 12 foot ceilings and walls, both with the remnants of decorative tin, and a secret exit, they realized there was more to 294 than meets the eye. All evidence indicates that 294 Main Street, which was built in 1907, became a speakeasy in 1920 or thereabouts when Prohibition began. The then-owners seem to have dug a deeper basement to create higher ceilings, dressed up the walls and provided a discrete entryway in the back, through iron basement doors that lay flat on the ground. Today Charlotte’s Speakeasy (open since November) can only be accessed through a secret door in the ice cream parlour and only with a changing secret password (available on the website). If you don’t have the password, you can try the ice cream servers, but not the 6’9” bouncer, ‘cause he ain’t telling. Once in, check out the tin walls of the landing, embossed with dramatic fleur-de-lis, a gorgeous salvage from the original speakeasy walls. In fact, once down the stairs, you are immersed in a Jazz Age setting (designed by Leah Plevrites of studioBIG and executed by Jim Kalinowski of Dreamworks Construction) where many of the details, like the bar, are made from the original wood beams. An original sign from the front of the building when the cover business was a women’s clothing store hangs by the bar. Framed black and white images of DeVito relatives dating back to the early 1900s add vintage credibility to the Art Deco-inflected scene. 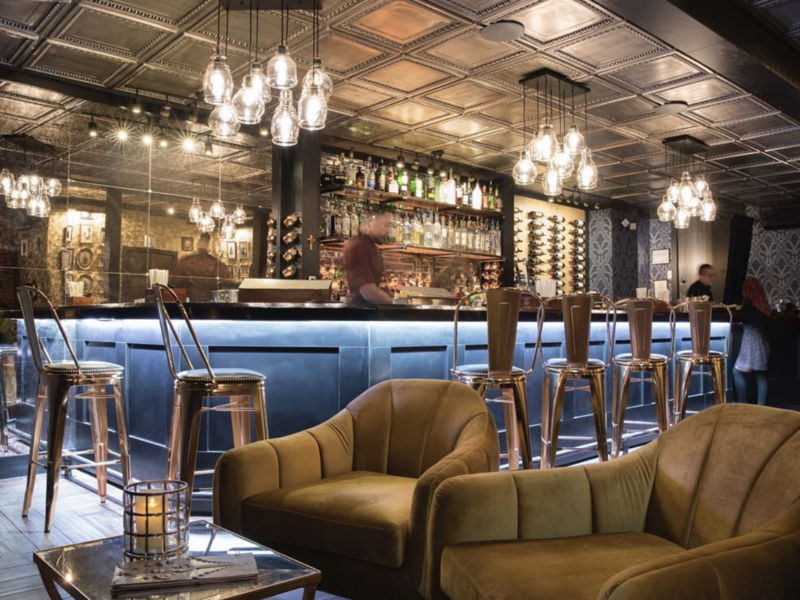 And of course, there are cocktails to keep you in the – ahem — swing: mules, gin rickeys, side cars and something called The Capone in addition to local beers (signature suds coming soon from Lithology down the block) and a varied wine list. The original back door entrance takes you to outdoor garden seating. If you’re lucky, you’ll get a glimpse of the old escape route: a secret passage that leads out through the shoe repair next door. Charlotte’s Speakeasy is only open Thursday, Friday and Saturday and seats only 50 indoors. They don’t take reservations so you need to get there early to get a table. Dancing does indeed happen and there may be Swing Nights every third Wednesday if all goes as planned. Tell ‘em Natalia sent ya.